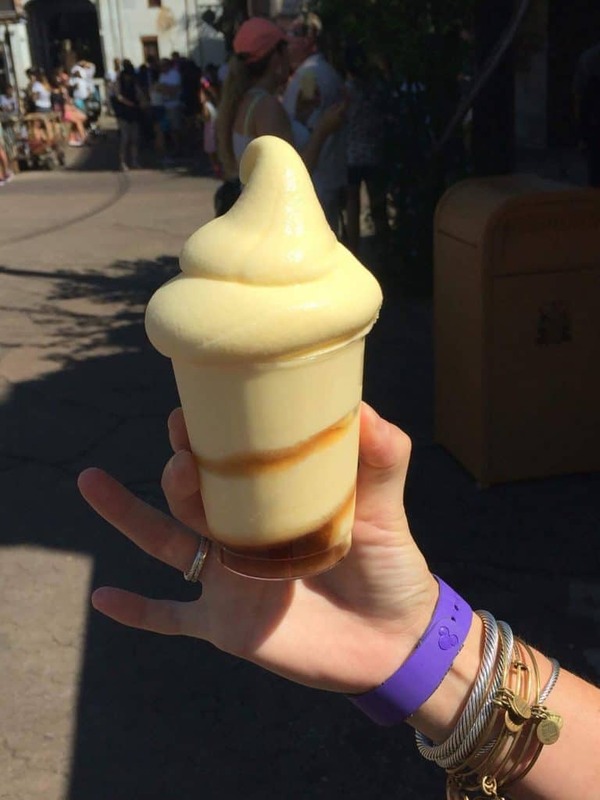 Check out the Top 8 Must-Have Snacks at the Magic Kingdom. These snacks will have your mouth watering and have you ready to book a Disney World trip just to sample these delicious morsels. When putting together your Walt Disney World vacation, what is the first thing you start planning? For me, I’m not spending time thinking about which hotel is best for my family, nor am I creating a list of must-do attractions; the first thing I want to plan is the snacks! Snacks, snacks, glorious Disney snacks; I dream about the delicious, delectable, and unique snacks that only Disney can do right. It is not uncommon for me to start thinking about which snacks I plan to purchase on my next Walt Disney World vacation while I am waiting in line to get a snack on my current trip. In fact, I love the snacks at Walt Disney World so much that I have gone on entire vacations where I dined only on snacks instead of purchasing counter service meals. I figure that if I love Disney snacks this much, there might also be others who feel the same way or who are curious to know which snacks are worth the money (or snack credit on the Disney Dining Plan). 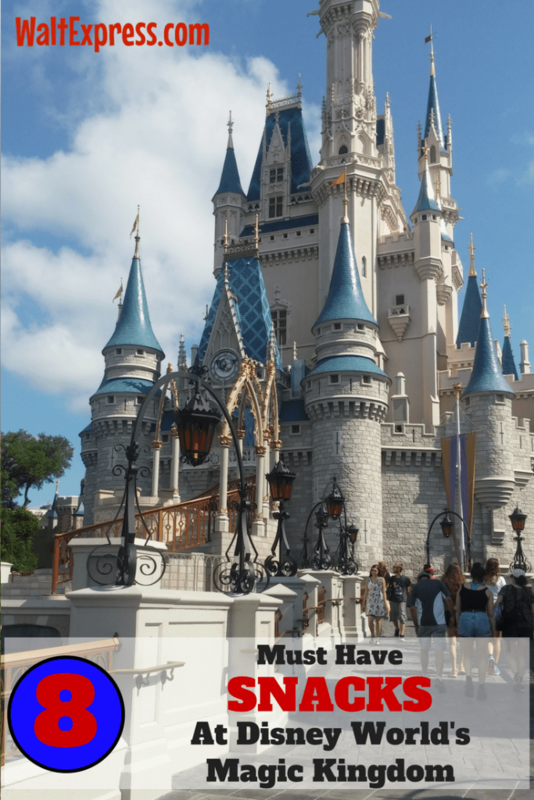 Well, look no further because this self-proclaimed Disney Snack Queen is going to give you a whole series on the best snacks in each park and I will round the series off with a look at the top 10 from all of the parks and resorts combined. For clarity sake, I have only included items that qualify as a snack on the Disney Dining Plan for this series. To start off the Top Snacks in Walt Disney World series, let me take you to the very first place I ever experienced a Walt Disney World snack, The Magic Kingdom. Popcorn, popcorn, get your popcorn! Who doesn’t love the salty, buttery, yet crisp perfection of popcorn? For some reason, it tastes even better when you can savor it while walking down Main Street. My son always requests popcorn the minute we walk under the train station and my husband and I are happy to oblige…as long as he shares. There is a kiosk located on the left-hand entrance close to Town Hall and you can smell the freshly popped popcorn as soon as you walk in the park. Our family feels like The Magic Kingdom is made more magical if we are savoring a box (or specialty bucket!) of this timeless, salty snack as we walk down Main Street. 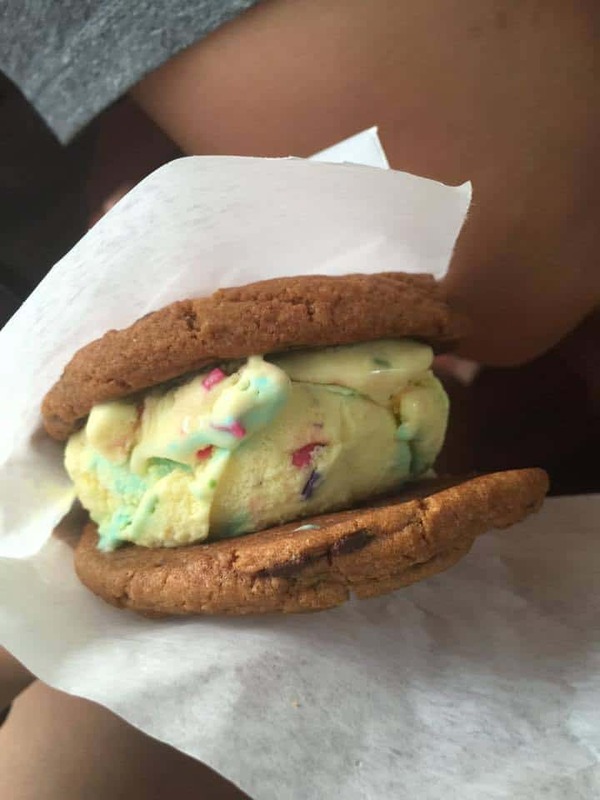 Ah, the walk down Main Street U.S.A. would not be complete on a hot day without a stop into The Plaza Ice Cream Parlor for an ice cream cookie sandwich. This ice cream sandwich is far superior to those sold at the carts throughout Walt Disney World. Why you may ask? Well, because the cookies are freshly baked here AND you get to choose your favorite flavor of ice cream to go inside the fresh cookie sandwich. It’s hard to beat a freshly baked cookie with hand-scooped ice cream nestled inside, so please don’t make the mistake of skipping this fabulous snack if you are visiting during the warm/hot weather months. Do you know what else my family loves to purchase on hot, summer Disney days? The Frozen Raspberry Lemonade! This perfectly icy, tart treat can be found just a skip away from The Mad Tea Party ride in a quaint looking snack stand known as The Cheshire Café. While most people flock here for the cake cups, I always have my eye that fantastic frozen lemonade. 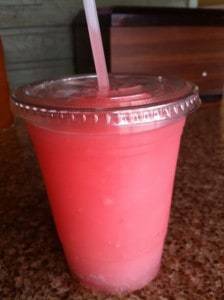 On a hot Florida day, I much prefer the tangy, tartness of the frozen raspberry lemonade over the cake cups or even the traditional frozen lemonade. This cold treat always hits the spot with just the right amount of sour and sweet, icy goodness and it’s always on tap at The Cheshire Café. Years ago, before Starbucks took over, you could follow the scent of warm cinnamon straight into The Main Street Bakery, where they sold large, perfectly iced cinnamon rolls. However, if you are looking for the same cinnamon roll your parents ate years ago at Walt Disney World, you will now have to venture a little farther into the parks and head over to New Fantasyland. 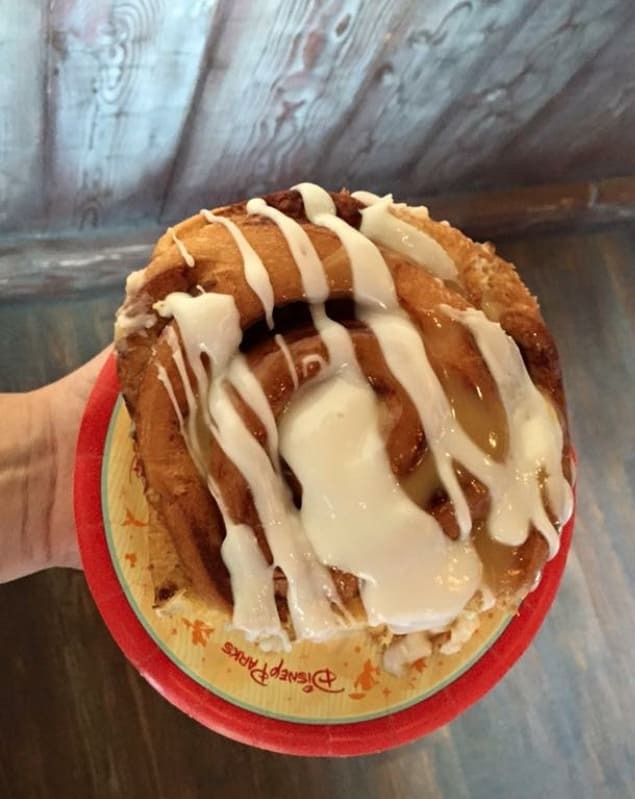 Gaston’s Tavern is now the home to the classic Walt Disney World cinnamon roll. Don’t let the name fool you though, this is not your run of the mill cinnamon roll; this thing is massive and so delicious. It’s moist, but not mushy and it is quite literally bigger than my hand…heck, it might be bigger than my head. This snack costs less than $5.00 (or one snack credit) and can be shared by a family of four as a snack or you can make a meal out of it for two people. Now that’s a rare bargain at a theme park! Everyone loves Mickey and I think it’s crucial to have at least one Mickey shaped treat on my snack list. 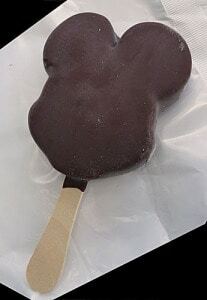 My personal favorite of the Mickey shaped items is the Premium Mickey Ice Cream Bar, which can be found at snack carts around The Magic Kingdom. I love this little ice cream bar because it is the perfect combination of simple vanilla ice cream and crisp chocolate coating for a hot day at the parks. I don’t think this snack is good enough to top the list, but this treat makes it to #4 for sheer sentimentality; it was the first snack I ever ate at Walt Disney World and so it will always hold a special place in my heart and in my snack budget. If you have never had this ice cream treat, give it a try on your next trip and maybe even consider spreading a little magic by purchasing an extra to give to a child who looks like they need an ice cream break. I can promise that you’ll make a memory neither of you is soon to forget. Nestled behind the Magic Carpets of Aladdin is the new location for Aloha Isle. This location only serves up one specialty, but it’s one of the most well-loved and popular snacks on property…the Dole Whip. You can purchase this pineapple soft serve in a cup, but my family prefers to cut the super sweet taste of the pineapple ice cream by requesting the float version, which is made with refreshing pineapple juice. At this point, you might be screaming at your screen saying, “#3, you put the Dole Whip at #3?!?! The Dole Whip should always be #1!” However, we will have to agree to disagree on this one. To me, the Dole Whip is just a little too sweet for my tastes, especially now that they no longer offer the vanilla or orange swirl options. It’s still a refreshing favorite, but it no longer tops my family’s list anymore. If you are still with me after reading that the quintessential favorite is not my #1, then you might be wondering what in the world could possibly be better than a Dole Whip. Well, one of my favorites also happens to be a unique treat, but it can only be found in one place in The Magic Kingdom. 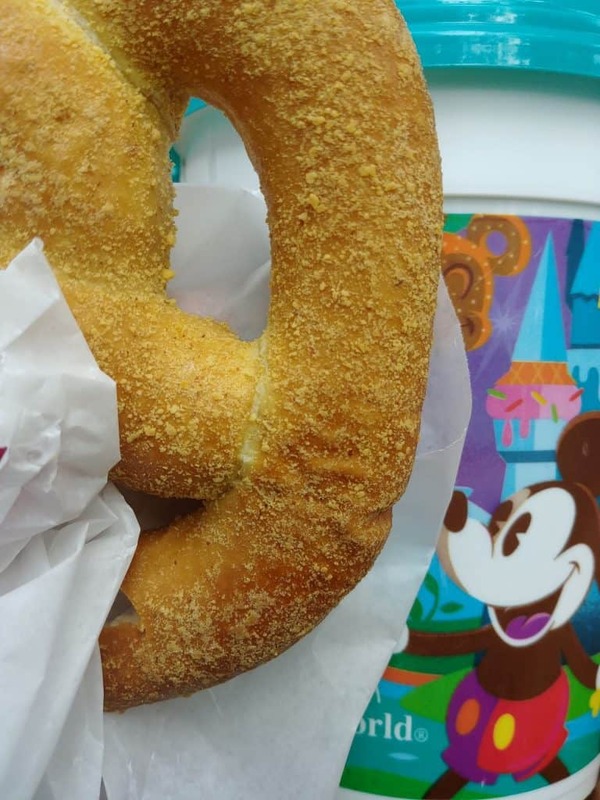 In Tomorrowland, the Lunching Pad serves up unique hot dogs and other quick treats, but the real treasure here is the cream cheese filled pretzel. Now, you may have noticed by my list that I am a big fan of carbs and sugar (but not too much sugar) and this snack most certainly fits the bill. The Lunching Pad has found the best balance with this pretzel by serving it up warm with a dusting of mildly spiced, soft breadcrumbs on the outside and piping the inside full of the most perfect cream cheese filling. Let’s talk about the filling for just a moment, because this cream cheese is the stuff of dreams. The cream cheese icing the Lunching Pad uses is barely sweet and has the robust and unique tang that a good cream cheese icing should always have and in fact, it’s almost exactly like the icing my mother-in-law makes for her famous red velvet cakes. This is not the sickeningly sweet version found on most mass-produced baked goods, this is the real deal and it makes this snack an over the top hit for me. Do not wait too late to grab one of these, because they often run out of this delicious snack early because I’m not the only one with a mild crush on this pretzel. You can find many treats that will surpass your expectations at The Main Street Confectionery, and the cake pop here is so delicious that I made it my #1 snack in The Magic Kingdom. What’s so special about this snack? 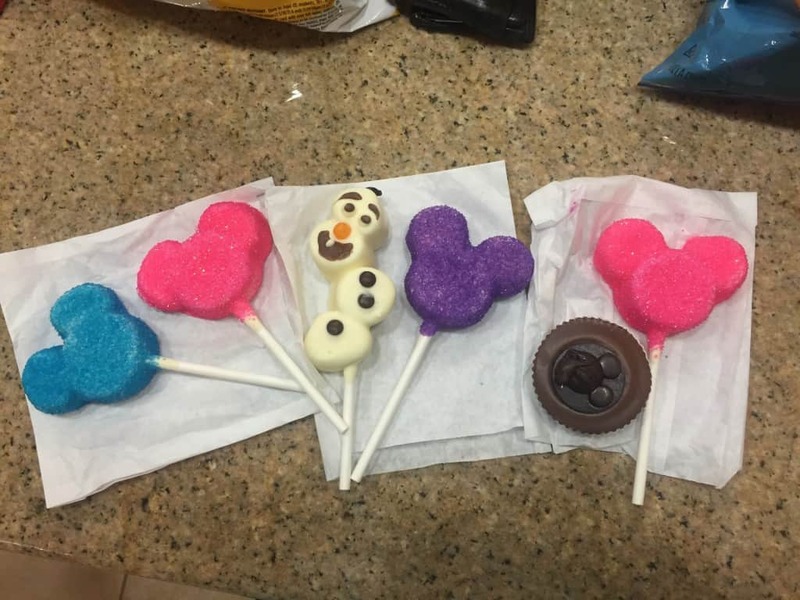 Well, it may have something to do with the fact that they come in several adorable varieties or maybe it’s because the Mickey ears are made of white chocolate covered marshmallows and one bite instantly satisfies the need for something sweet. Even the core of the cake pop is amazing and for me it’s the real star of this snack with its perfectly moist, dense cake center that is reminiscent of homemade raw cookie dough. My family never misses the chance to get our hands on a cake pop and we have been known to visit The Main Street Confectionery more than once in a day to get our fix. When it all comes down to it though, I think the cake pop earns the #1 spot because there is something quite magical about always having the same treat every time you go to The Magic Kingdom. Oh gracious, now I’m salivating just thinking about it. Who wants to bring a cake pop from Disney World? No takers, huh? Well, that must mean it’s time for us to plan our next trip so I can get my hands on one…or three. So there you have it, my top five snacks at The Magic Kingdom. Did I leave your favorite off the list? If so, please leave a comment and let us know what snacks I should have added to the list. 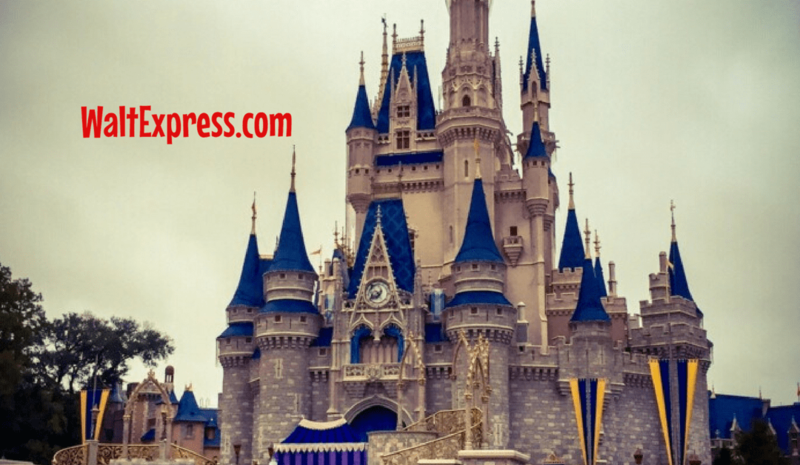 Also, don’t forget to follow Walt Express and on Facebook to see how your top 5 and my top 5 snacks stack up against each other around the rest of the Walt Disney World theme parks and resorts. By following us, you can read the next installment of the series as soon as it comes out. Look for my Top 5 snacks to grab at Epcot two weeks from today. Until next time, we hope that your days are filled with faith, trust and pixie dust.